We enjoyed our tour with latitzia! She was very knowledgeable, sharing many interesting stories and fielding questions from the group. We thoroughly enjoyed our tour! Latitzia went the extra mile - she helped with photos and, because we had a tight turnaround for our next tour, she escorted us to a spot where we could grab a slice of pizza while she arranged for a cab. Great tour and great tour guide!! We went during the Rome Marathon, it was chaos, even so she managed to triumph over the crowds and service closures, change the order of the tour and still see everything. She was very knowledgeable and her explanations were facinating! No issues with strong accents either. Thanks! Very nice tour guide. But they changed the time on us, which made our tour of the Vatican feel rushed because we had to hurry to catch the new time. Our guide wasn't easy to understand and gave us a history lesson, and missed giving us the big picture overview. We had a very good time on the tour, exploring the areas of Ancient Rome and learning about some of the history. From the Forum to the Palatine Hill we learnt about the general history of the area and the power that the Caesars had. 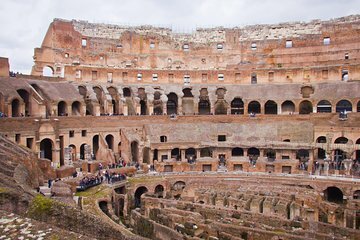 The Colosseum was obviously geared toward its own history and importance, but was very well delivered and we discovered things about it that we didn’t previously know. All in all, money well spent. Our tour guide was fantastic! She not only knew the history, but could take you back in time so you could picture yourself at an event in the Colosseum. She brought history to life! I highly recommend this tour. It was a very good trip - very good value and lots of interesting facts. I would recommend it. The guide demonstrated a lot of knowledge. Diego, my guide, was so knowledgeable about ancient Roman history. I had a million questions because his sharings further sparked my curiosity, and he had answers to it all. I especially appreciate that he intentionally ended our tour on our day (March 15) at the spot and time where a historical recreation of the Ides of Rome would be held. What an incredible day! Our tour guide Dennis was very friendly and knowledgable! So worth the price and time! Answered any questions we had! The groups were medium sized but everyone felt included throughout the entire experience!